The Royal Botanic Garden (RBG) was founded as a non-governmental, non-profit entity in 2005 to conserve the native flora of Jordan. RBG’s mission is to ensure native flora conservation through ecological restoration and providing research and demonstration site to address the environmental challenges of our times and generating hope for the future. The RBG envisions a society where there is no longer a need for plant conservation. Where the interdependency between people, plants and ecosystems is well understood, and where all Jordanians are assured of a dignified and sustainable life. Jordan is particularly rich in plant species, having approximately over 2,600 species of vascular plants. Due to pressures associated with desertification, e.g., drought, over-grazing, soil depletion, urban sprawl, many of Jordan's plant habitats are threatened or on the verge of extinction. RBG will function as an instrument for addressing Jordan's conservation challenges and interpreting both problems and solutions. In the course of its work, the RBG is working closely with the government to reach certain goals in order to meet Jordan’s commitments to the Convention of Biological Diversity. Establishing a botanic garden is part of the biodiversity strategy and action plan prepared by the Ministry of Environment to implement the 1992 Convention on Biological Diversity, ratified by Jordan in 1993. 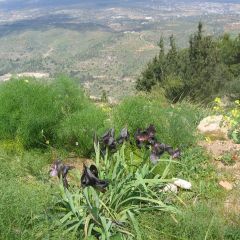 The Garden site is located in Tal Al-Rumman, about 25 km north of Amman, on steep slopes overlooking King Talal dam. The site comprises a significant variety of soils and microclimates, several wadi systems, a perennial freshwater stream and over 300 m of elevation change within its boundaries, offering a wide range of possibilities for botanical research and display. RBG is a conservation-oriented botanic garden with three main components, First is the Science and Conservation Component; RBG aims to become an internationally recognized research facility while focusing on plant conservation.Second is the Education and Community Development Component; Using the findings of the scientific component, RBG would develop interpreted findings to the general public as to educate them on the plant diversity of Jordan. Thus, it is a complementary process of gathering information, taking action and disseminating this information. Furthermore, The Royal Botanic Garden will be developing income generating micro projects for the local community in Tal Al-Rumman. Third is the Sustainable Living Component where RBG will be a demonstration site for eco-living. "Our aim in establishing the Royal Botanic Garden in Jordan is to make it a centre to enhance public education and scientific research, serve as a tourist attraction and, most of all, conserve Jordan’s natural environment and biodiversity for generations to come."